Do you know exactly what you’re looking for in a custom t-shirt? 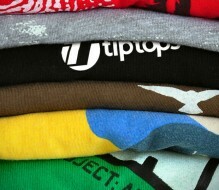 Tip Tops’ website is formatted to help you customize your perfect t-shirt yourself to make your next event even better. While our design team is always standing by, we know that you may already have a “look” in mind for your event. On our website you are able to select your style of t-shirt, color, sizes, and most importantly your design. We have plenty of stock designs and fonts you can choose from or you can upload your own logo. Our innovative process will allow you to modify the front and back of your t-shirt on your own terms. Your friends, family, or employees at your next gathering won’t believe that you designed the t-shirts yourself. Tip Tops is proud to be your place for custom t-shirts in Florida, and our direct customization development will have you and your crew looking more cohesive than ever.